This innovative study considers one of the most important art and design movements of the 20th century, the Bauhaus, in conjunction with current research in public relations and organizational communication, elaborating on the mechanisms of internal and external communication available to influence the stakeholders in politics, society, industry, and the art world. In a movement where a substantial share of productivity ran in measures to highlight the public value of the institution funded by the taxpayer, the directors, and other persons in charge, the Bauhaus developed comprehensive strategies to communicate their messages to a variety of target groups such as politicians and economic leaders, intellectuals and other artists, current and prospective students, and the general public. 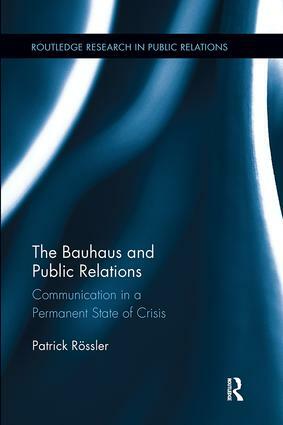 To achieve this goal, the Bauhaus anticipated many instruments of modern public relations and corporate communications, including press releases, staging of events, media publications, community building, lobbying, and the creation of nationwide public presence. Rössler argues that as an organization, the Bauhaus cultivated corporate behavior and, most prominently, a corporate design which unfolded revolutionary power. The basic achievements of new typography (a label coined at the Bauhaus) determine visual communication to this day, while the Bauhaus moved from an institutional organization to a community. Beginning with an overview of the Bauhaus’ corporate identity and a close examination of the respective directors’ roles for internal and external communication, this book visits exhibitions, events, and the media attention they evoked in newspapers and contemporary periodicals, along with media products designed at the Bauhaus such as magazines, books, and bank notes.